GayDating is a simple and easy to use website which offers their services to both gay men and lesbians with identical functionality. Upon the initial visit to GayDating, visitors are directed to the zip code search portal for gay men. 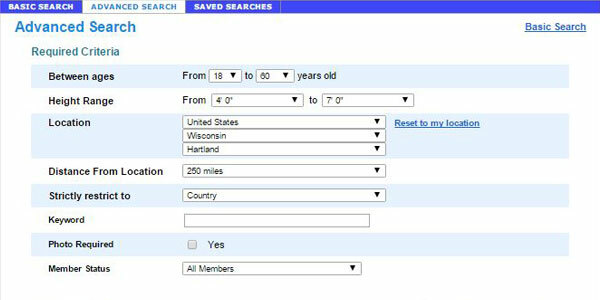 Lesbians can get to their own zip code portal via a link in the upper left that reads "Are you a woman seeking a woman?" This platform is ideal for gay and lesbian singles looking to keep their options open and helping them in their search for other singles in their area. The general layout of the site is similar to other dating sites, and functions primarily as a searchable database. It also has an element reminiscent of apps like Tinder (described in "features"). GayDating offers the standard features like search (basic and advanced), messaging (with a send-only limitation for free members), the ability to upload multiple photos, etc. Users are also able to view who's currently online, as well as see data on their site activity, messages and visits by other users. One of the most interesting features is that of the "matches" section, which takes users through a series of profiles they may be interested in one-by-one and allows them to say "yes," "no," or "maybe" to meeting up. It's essentially similar to popular app Tinder, with the same ability to view mutual matches. It's a nice little feature that could endear the minimalist nature of GayDating a little more to the smartphone crowd. Sign up occurs fairly early on in the process, with prompts asking you to create a membership in order to see the photos of potential dates in your area. On the one hand, this can seem obnoxious, as many people just want to see what's available before going through the trouble of signing up. On the other hand, it helps keep out scammers and nosy individuals with no interest in dating. The GayDating sign-up wizard pops up after you enter your zip code on the main page. It then asks you to create a username and password, describe yourself (with provided dropdown list options), then describe your ideal date (with similar dropdown list options). Then, you're all set and free to browse the local singles! The strongest element of the site that serves as a safety measure is the requirement that a visitor must sign up before viewing any local profiles. This might serve as a sort of de-facto privacy filter; someone looking to out a still relatively private individual for whatever nefarious personal reason won't be able to get in without creating an account themselves (It's easily done, of course, but it may be just a step far enough for them to give up). Other than this, safety is average, with most security measures in the form of profile requirements and active moderation. All photos must be approved by site admins before they are visible to other members, which helps to filter out some fake or insincere profiles. Regardless of the little they can actually do, it goes without saying that member safety is definitely important to GayDating as a business. The GayDating intro page can be confusing; a woman might leave the site before she even notices the link to get into the lesbian portion of the site. Although after that point, users can navigate the website easily enough, as it follows a layout similar to other popular dating and networking sites. For online dating newbies, the simple navigation systems, designand major functions like searching, messaging, viewing matches, and editing one's profile are well-labeled. Plus, the site is also easily accessible by Spanish and Portuguese speakers, with an option to switch languages in the upper right corner of the site. GayDating's basic search function is fairly straightforward, offering the standard location, age and distance search, keyword search, and a set of sort options to help members organize profile results. The site also offers an advanced search, which allows users to select for very specific characteristics, including education, faith, income, and career. This is a straightforward, no-frills LGBT dating site for those who want to avoid heavy matching algorithms and who prefer to vet potential dates by reviewing their profiles personally. There is some matching done based on user-identified interests and preferences, but the site overall remains true to its simple purpose as a local gay singles directory and network (as opposed to a matchmaking service). Some users may be deterred by the requirement to be a paying Gold level member in order to read messages from other singles, though it's not an uncommon limitation amongst dating sites and it’s recommended so members can get the most out of the service GayDating.com provides to help them find the love they are looking for. If GayDating doesn't sound like the right fit for you, consider our review of EliteSingles.com - a great dating site for professional singles.